Also known as a fitted valance or box valance. We all know beds can provide a great space for storage, hiding holiday cases and any number of items completely out of site. But if you haven't got anything covering the divan it can look a mess and cluttered. Detracting from your beautiful bedroom! Valances are great for covering tired divans or covering untidy messes. 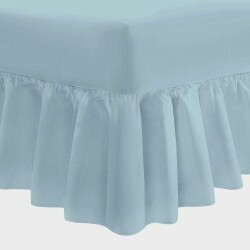 Combining a fitted sheet with the valance, it fits over your mattress with the attached frill dropping straight over the divan base. Leaving a beautifully neat bed in one fail swoop! Made from either luxury plain dyed poly cotton or 100% Cotton fabrics. We make to any mattress depth or frill drop. Made in house at our Lancashire factory. Manufactured to fit any size from single to king size and beyond. Available in a great range of colours to suit any room. Choose between three frills: Frilled, Box pleated or Single Pleat. Check the product page for images of frill designs. A massive range of sizes are available including all double king size and European sizes. Our bedding is cut to order so can be made to fit any mattress depth or frill drop. If you would like more information or fabric samples please call 01706 220020 or email us with your bed size. We'll be happy to help. Double Fitted Valance Sheet - 4ft 6" x 6ft 3"Fits easily over your mattress with a frill to cover th..
Take the hassle out of changing the your valance with a valance sheet. No need for heavy lifti..
160 x 200cm Valance SheetFitted Valance Sheet for European kingEuropean / Ikea small king beds are s..
7ft x 7ft Box Valance in 1000 Thread Count CottonMade to fit 215 x 215cm emperor bedsA fitted valanc..
80 x 200cm Valance SheetSmall Single Fitted Valance in 50/50 Easy Care FabricEuropean / Ikea small s..
90 x 200cm Valance Sheetlong Single Fitted Valance in 50/50 Easy Care FabricEuropean / Ikea long sin..
90 x 215cm Valance SheetLong single fitted valance in 50/50 easy care fabricLong single beds are sli..
100 x 200cm Valance SheetMetric Single Fitted Valance in 50/50 Easy Care FabricFinding bed linen for..